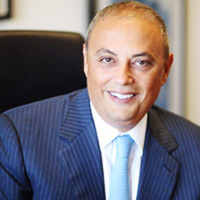 Safwan M. Masri is Executive Vice President for Global Centers and Global Development at Columbia University. As an ambassador for Columbia, he cultivates relationships with Columbia alumni and with international leaders, essential to the continued development of a global Columbia. In this role, he helps coordinate various University-wide global initiatives, and works to extend Columbia’s reach to match the pressing demands of our global society. Professor Masri is responsible for the development of an expanding network of Columbia Global Centers, located in Amman, Beijing, Istanbul, Mumbai, Nairobi, Paris, Rio de Janeiro and Santiago. The Centers promote and facilitate the engagement of faculty, students, and alumni with the world, address global challenges, and advance knowledge and its exchange. He has been Director of the Columbia Global Centers | Middle East since its founding in 2009. He earned his Bachelor of Science degree in Industrial Engineering from Purdue University in 1982; his Master of Science in Industrial Engineering also from Purdue in 1984; and his Ph.D. in Industrial Engineering and Engineering Management from Stanford University in 1988.